These photos were taken spontaneously this past weekend. The sun was setting and I didn't have a specific location in mind, so we randomly pulled over by this residential community. I walked around hoping to find a plain wall but instead I came across this gorgeous wheat field. Ok so it's not really a wheat field, more like a dead wheat field. The lighting was perfect though, the yellow field looked beautiful next to the blue lavender sky. 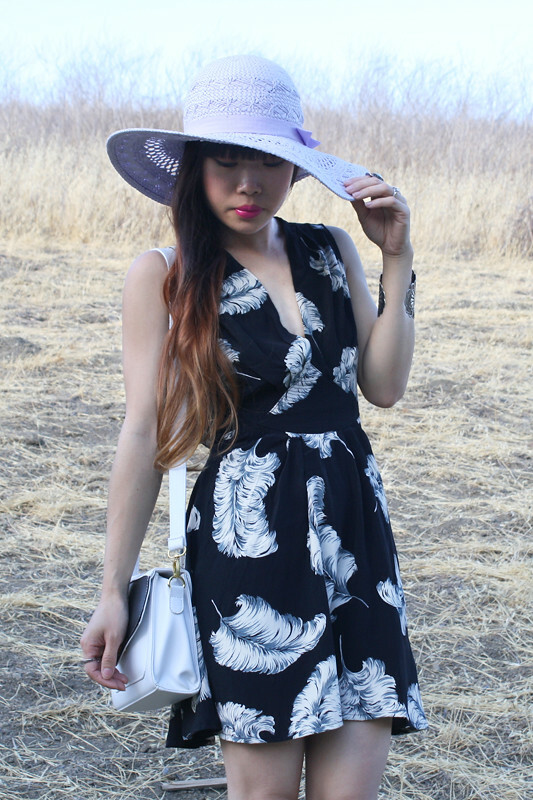 I wore this dress with gorgeous feather print by Motel with chunky booties and hat. I mixed the black with lavender accessories to soften the look. I might be starting to really enjoy wearing black but I still like to play with patterns and girly elements. Feather print dress c/o Motel. Lavender booties by Shoe Republica from UrbanOG. I love those colors. Lovely lavender! mmm! lavander litas and feather dress! What a combo, love it totally!! Your lavender boots are truly incredible! <3 <3 <3 and I am oh-so in love with your feather dress! Beautiful!